When Choosing A Bridal Gown Consider Your Body Shape Type! Before choosing a bridal gown you need to identify your body type or shape. Fashion experts have named some basic body shapes or figure types that categorize woman's figures. So likely you will fall into one of the categories below. Which "body shape" are you? Pear body shaped or triangle shape- has wider hips than upper portion of the body. Apple body shape or diamond shape body- widest point is the mid-section which includes the waistline and stomach areas. Rectangle body shape- the bust, waist and hips form a basically a straight line with very little waist indention. Hour glass body shape - the waist is the focal point because it is smaller when compared to the bust and the hips, which are balanced to each other. Inverted triangle body shape - the bust is prominent and not in balance to the waist and narrow hips. When choosing a bridal gown, it doesn't matter what body shape or size you are, because you can still find the perfect wedding dress that compliments you! "What matters is that you choose a wedding gown that wil work with your figure and not against it." You probably are wondering. 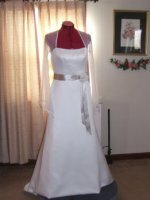 . . which wedding gown is best for which figure body type? That will be covered later. But for right now, guess what? ---- You need to do some further evaluation of your body shape! It's time to take a good look at yourself... You likely already know your body shape or figure type. Just in case you don't. Take a look in a full length mirror. Observe yourself from the front and the side view. What do you notice? Do you have a prominent bust or wide shoulders? Maybe you have wide hips, large thighs or a rounded bottom. Are you full around the middle section? Perhaps you have no defining curves when it comes to your bust, waist and hips. Or maybe you feel you are too curvaceous with a very small waist in relation to your bust and hips. Besides your shape, "your overall appearance" including your height, size and specific body areas must be considered. Even though you fall into a basic body shape, there may be specific areas of your body that may concern you. These areas can be camouflaged or less attention paid to them by placing the focus somewhere else on your body.